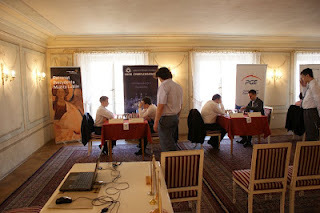 The friendly chess match between Poland and Ukraine and The 4th International Grandmasters' Tournament - the Lublin Union Memorial - is taking place from May 23 to May 29 in Lublin, Poland. The tournament is played in double Scheveningen format, where each member of one federation plays twice against all members of the other team. One leg will be played with classical time control, the second leg will be in rapid. After 3 rounds Ukraine lead 10-5.